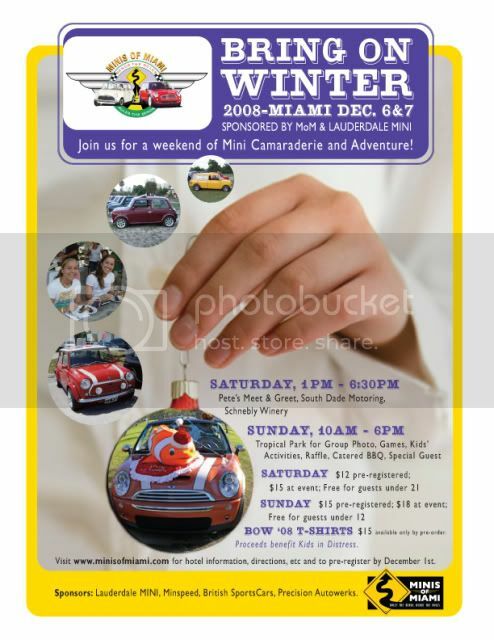 Minis of Miami is celebrating the tremendous growth of our club in 2008 by expanding our annual picnic to a weekend extravaganza! We want all Mini Enthusiasts and their families to come down from all over the state and beyond. We packed the schedule with fun activities to entice you! Click here to see full image of the Bring of Winter 2008 Invitation! Online pre-registration and hotel information now available! Last edited by Mrs Clubman on Sun Nov 02, 2008 10:13 am, edited 1 time in total. Click for all the information you need for the picnic. Hope to see everyone there! WOW this event gets bigger and better every year. If you miss this one you miss the biggest best Mini/MINI event of S. Florida and have to wait till next year for it to come around again. So jump into that car you love to drive and come on down!!!! The Captain's first mate argh!!! As details become available, I'll be starting new threads. Look there for additional info on individual activities, including directions. I have started a dedicated webpage on the club website for details and directions. See it here. We might be in SoFl that weekend. If we are, we might just have to crash your party! Although I'd love to see everyone for BOW Day 1, there is another MINI event scheduled at the same time. MINIUSA and the Panthers are putting together a Mini Tailgate Party before the game at Bank Atlantic Center in Sunrise. See this thread. This could be a Plan B for out of towners who can't make it to South Dade in the afternoon. You could get as far south as Broward for the Tailgating. Then you'd be within 35 miles of Tropical Park for BOW Day 2. You've come that far so why not extend your Mini fun! As if the activities already on the schedule werenâ€™t enough to keep you and your family entertained, we have added more fun! On Saturday, Schnebly Winery is staying open late for a special event! We can continue our party with live music and dinner! On Sunday, you can get a caricature done of you and your Mini! Massive Motorsport has covered the artistâ€™s expenses so that 100% of your donation for the caricature can be given to our Motoring Heartsâ€™ Charity, Kids in Distress. We've received about 30 pre-registrations for both days of the event so far. That's pretty good! But dont' miss out on the pre-registrations prices. Remember that day of registrations for both Saturday and Sunday increase by $3.00. We are looking forward to what promises to be a fantastic weekend for all Mini enthusiasts. Mrs Clubman wrote: Although I'd love to see everyone for BOW Day 1, there is another MINI event scheduled at the same time. MINIUSA and the Panthers are putting together a Mini Tailgate Party before the game at Bank Atlantic Center in Sunrise. See this thread. Guess my wish came true! You are all chose to come to Bring on Winter.The Panther promoter called me to say he had little response for Dec 6th. Look for the Mini Tailgate Party to be rescheduled for March 2009. Looks like everyone had a fabulous time at BOW! The photos show upwards of 200 smiles per hour! Now thatâ€™s an event packing some serious horsepower! Click this link to view the Bring on Winter Weekend 2008 Photo Collectionand relive some fun & exciting moments. If you missed this event, then youâ€™ll just have to settle for vicariously enjoying our adventures. And next year youâ€™ll be sure to be there! We raised $600 for Kids in Distress. I dropped off our donation Saturday morning. I explained that we have an annual event, all proceeds from our raffles are specifically for Kids in Distress. They are extremely grateful for the generous donation. Thank you to everyone who helped raise funds for such a worthy cause.